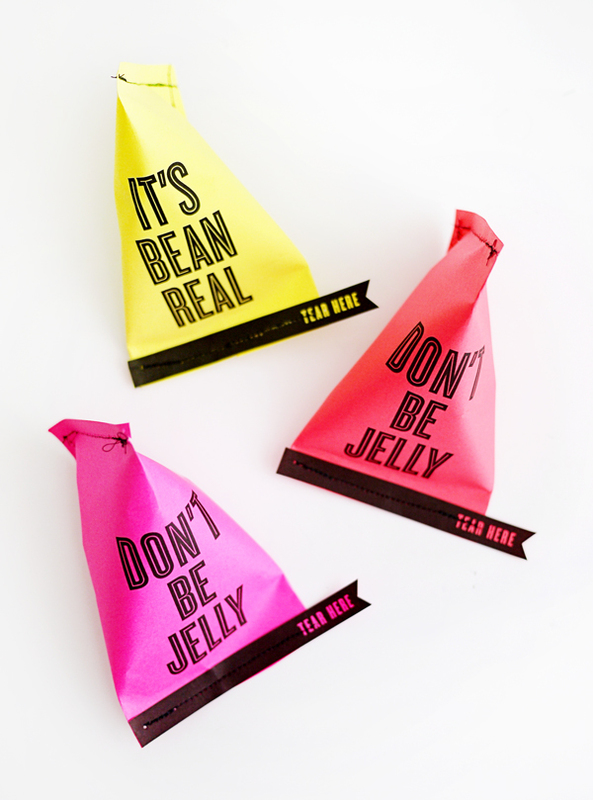 Did you know that April 22nd is National Jelly Bean Day? If not then you’re in luck! 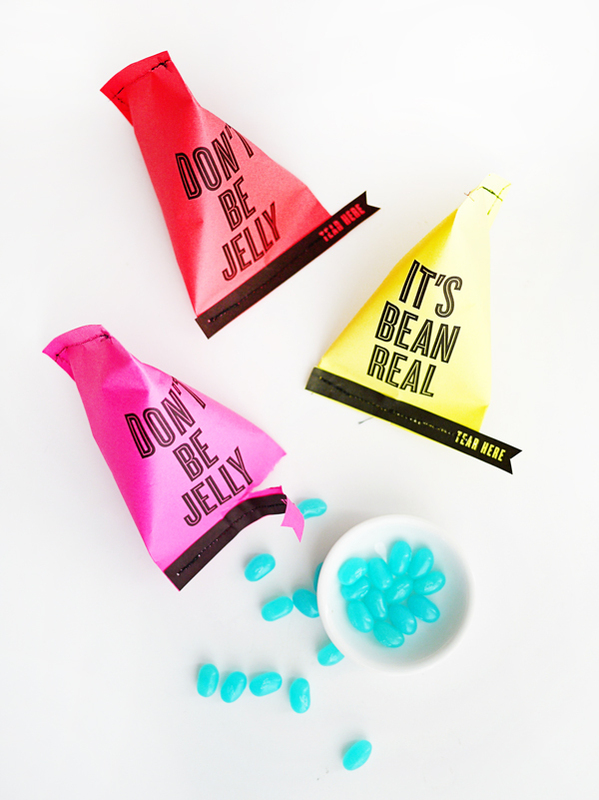 Surprise your friends with these silly jelly bean pouches. 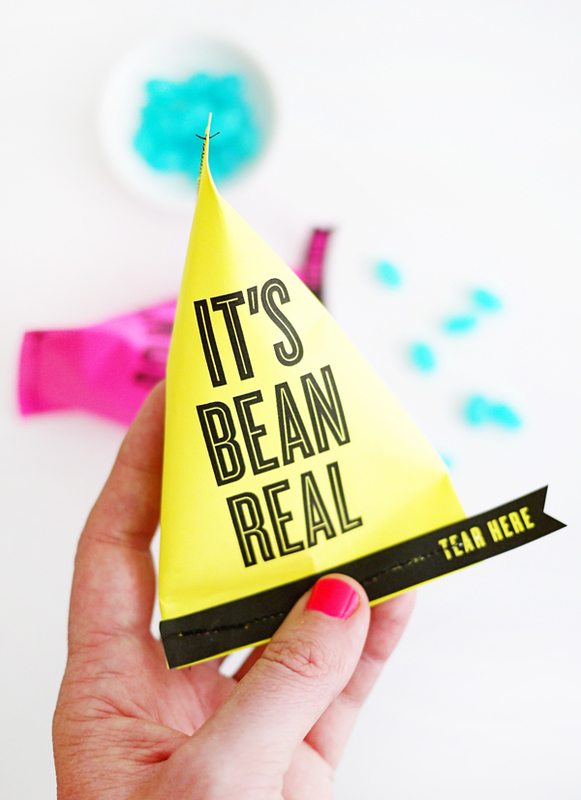 Make these as a fun give-away for a party or as way to sass up your Easter basket this year. Your friends will certainly want to tear right into them. 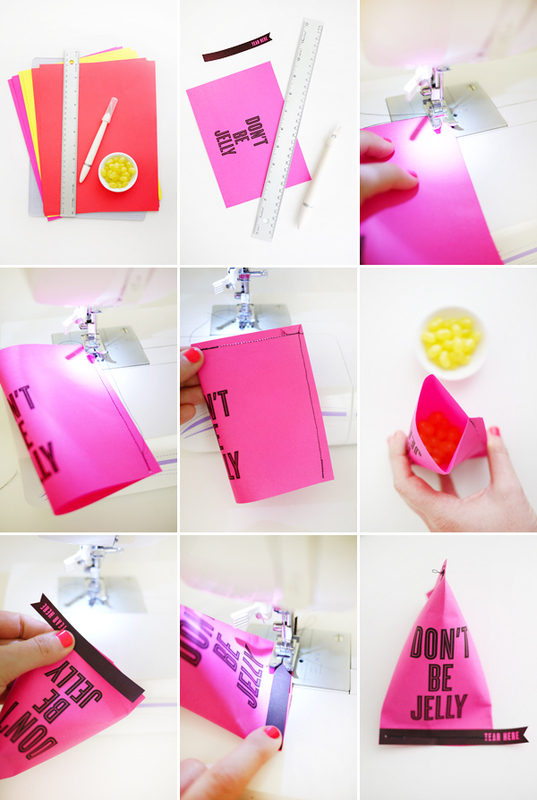 Materials: Printable Jelly Bean Pouch Template, 8.5 x 11 text weight neon paper (I bought mine from the Photocopy center at Office Max), ruler or straight edge, craft knife, colorful jelly beans, sewing machine (not pictured), black thread (not pictured). 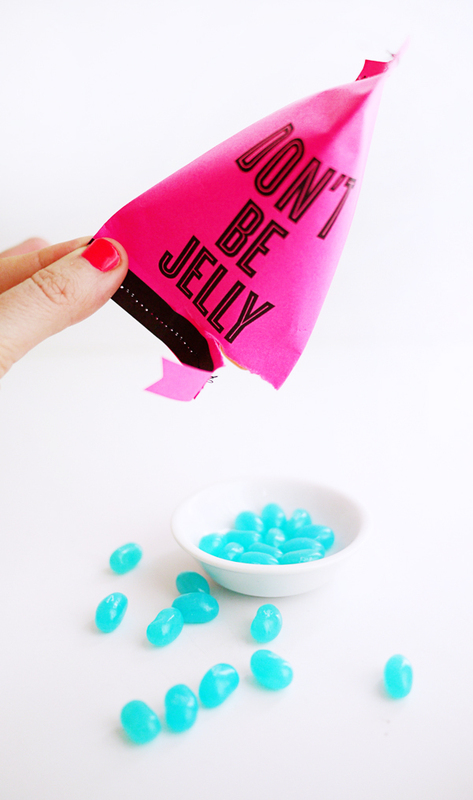 Step 1: Print out the Printable Jelly Bean Pouch Template on 8.5 x 11 text weight neon paper. Step 2: Using the straight edge and craft knife, cut out each template and “tear me” tab. Step 3: Gently fold one of the pouch templates in half (don’t crease the center) and sew the long side together (see photo). Make sure you don’t get too close to the edge so that the paper doesn’t rip. Step 4: Sew the top seam together (see photo). Step 5: Now that you have a pouch, fill about half way with jelly beans. Step 6: Cinch the bottom of the pouch together in the opposite direction that the bag has been sewn in. The long seam will now be at the back of the pouch and you will have a “triangle” shape. Step 7: With the bottom cinched together, hold the “tear me” tab over the bottom and sew the two pieces together to seal the pouch. Tear open the bag & enjoy. Just don’t spill the beans! Perfect for easter basket snacks! Going to try to make them this weekend. So cute! I adore the “tear here” seam! These are so clever! Perfect way to bring some fun to an Easter basket. where was this post last week when I hosted brunch and gave away a bag of jelly beans. Super adorable. I guess I’ll pin for next year. Oh my gosh. These are so awesome and creative! !